Much of what we know of the history of costume has been compiled from depictions of clothing and accessories in works of art from all periods and in all media, representing religious and secular themes. A little-explored avenue has been the function of garments and textiles in expressing the law, as found in illustrations to thirteenth- and fourteenth-century manuscripts of Roman and canon law. Here illuminators manipulated elements of fashion, fit, accessories, and hairstyle, to characterize passages that discuss, for example, the division of authority, marriage contracts, crime and punishment, or the proper behavior of laymen and clerics. The physical appearance of human beings and their surroundings in these pictorial compositions informs us about contemporaneous aesthetic conventions, and this visual construction of cultural identity gives us an idea of how the viewer was expected to react to the image. Along with their often ingenious interpretation of textual themes, legal miniatures cast some light as well on the ways in which artists visually presented complex juridical concepts to medieval viewers. 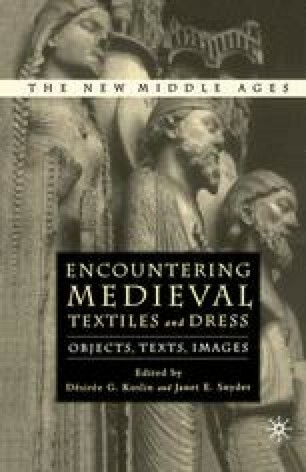 This chapter will explore three basic levels at which textiles and dress are used in a legal context: first, as background scenery; second, to identify protagonists, and last, to connote or explicate a point of law.